Tell me if you've heard this before: Carey is on its way to the 1AD2 Idaho State Football Championship. In an inevitable blowout win, the Carey Panther train stopped off at Idaho State University's Holt Arena on Nov. 12 and dismantled yet another opponent standing in its way for a title shot. Like a well-oiled machine pumping away, it only took Carey three quarters to put away the Castleford Wolves, 62-16. In what may have been the best game Carey has played all season, Coach Lane Kirkland's squad dominated on offense, defense and special teams. "This team is full of playmakers, they're all over the field," Kirkland said. "They've been playing together for a long time. They played together on junior varsity and in varsity practices against former state champions year after year, and that really helps get back to state." Carey (11-0) amassed 560 total yards while the defense held Castleford (8-3) to just 212 yards while forcing three turnovers. All game, the Panthers frustrated the Wolves' offense by clogging up run holes and making key tackles. "We do the same thing on defense that we always do, we just tackle," Kirkland said. "We find where the ball is at all times. Our line did some great work today. We filled those holes before the backs could get there. You have to dominate the line of scrimmage." Senior running back Charlie Rivera and junior quarterback Jordan Dilworth displayed an unstoppable one-two punch for Carey's offense. "I'm excited—we did great last year and we'll do better this year," said an enthused Rivera. "We're great as a team, and that helps a lot when we play." Rivera went wild, amassing 276 total yards (117 rushing, 159 receiving) while finding the end zone four times. Dilworth had another career day as he passed for 315 yards on 14-of-22 throwing with six touchdowns. Dilworth also had 68 yards rushing and a score on the ground. Coasting in the third quarter and on the verge of closing out the Wolves, Dilworth tossed a pretty pass to Rivera for a 77-yard touchdown, capping off the game and installing the mercy rule as Rivera crossed into the end zone. "I told [Rivera] to run the wheel route and he ran it perfectly," Dilworth said. Rivera then added, "Jordan did a great job—he put it up there and I caught it." With plenty of offense to go around, it's easy to forget how important Carey's special teams were. On Castleford's opening drive of the game, Carey forced the Wolves to punt deep in their own territory. 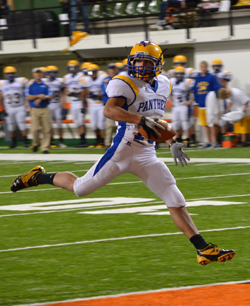 Senior Dillon Cenarrusa set the tone for the Panthers when he broke through the line of scrimmage and blocked the punt. Carey junior Garett Lee pushed the ball out of the end zone, giving Carey a 2-0 lead. Carey's special teams play didn't end there. Following a Carey touchdown, and up 30-16 in the second quarter, Kirkland called for an onside kick to throw off Castleford as sophomore kicker Luis Garcia put the ball perfectly in play. Carey stalled on the drive after Dilworth thew an interception to Castleford senior Kendall Kunkell; however, the fact that Kirkland called an onside kick gave Carey a psychological advantage. "We were aggressive today—you have to be aggressive when you get to this point," said Kirkland. "It's all on the line, and when you see something, you have to go after it." Despite a well-played game on all ends, Carey didn't play as disciplined as it could have. The Panthers had six penalties called for 40 yards. The Wolves had seven penalties for 75 yards. The Panthers, however, did own the game on third-down conversions, going six for eight on the day and one for three on fourth downs. Carey didn't punt all game. The Wolves didn't convert a single third down all game and were held to just seven first downs. The Panthers racked up 25 first downs. After the opening safety, Carey scored on a Baley Barg touchdown. Barg, a senior, finished with six receptions for 137 yards and two touchdowns. Carey then gained control of the ball again moments later and Rivera scored his first touchdown of the game. Before anyone knew what had happened, Carey was up 16-0 early in the opening minutes of the game. With 30 seconds left in the first quarter, senior quarterback Mitch Howard threw a pass to junior Mike Peckham for Castleford to make it 16-8. To open the second quarter, Dilworth and the Panther offense marched effortlessly down the field. Dilworth found Rivera on a 35-yard touchdown pass to cap off the drive. On the ensuing play from scrimmage, Howard then scored on a 70-yard QB sneak up the middle for Castleford. Howard found senior tight end Rylee Reynolds for the two-point conversion, but the Wolves wouldn't see the end zone after that. On Carey's following series, Dilworth found senior tight end Jack Cenarrusa open for a six-yard touchdown to put the Panthers up 14 points. Cenarrusa ended the game with 11 yards and a touchdown. Senior running back Chance Chavez (who finished with 58 yards rushing) scored on a two-yard dive after the Panthers forced the Wolves to turn the ball over on downs on Castleford's following drive. Carey was seemingly scoring at will midway through the second quarter. Even when Castleford found a way to stop Carey's offense, the Panthers still converted. On a fourth-and-15, Dilworth heaved a long pass to Barg, who was covered heavily by the Wolves' secondary. The defense wasn't turned around, and as the ball approached Barg, he turned around at the right moment to catch the pass and scooted into the end zone. With such a big part of Carey's offense going through the air (traditionally Carey is a run-oriented team), Kirkland said his team wanted to go with the spread offense rather than the tight-T offense the Panthers were accustomed to running. "We wanted to use the entire field," Kirkland said. "We have some great hands on our kids. We have a quarterback who can deliver, too." The Panthers would intercept the Wolves two more times in the third quarter (junior Francisco Gamino and Cenarrusa) before the Panthers closed out the Wolves' season. The Carey Panthers now plan for the Lighthouse Christian Lions, who beat Kootenai 66-20. Lighthouse Christian (8-3) put on a show of their own in the semi-final match. Scoring quickly and often, the Lions went up 28-0 before halftime in their game and didn't let down. Lighthouse Christian has three losses, one of which came to the hands of the Castleford Wolves on Sept. 16. The Wolves won 45-24. The 1AD2 Idaho State Football Championship will be held Friday, Nov. 18 at 1 p.m. at Holt Arena in Pocatello. The Carey Panthers honored Veterans Day by wearing commemorative helmets. The panther on Carey's helmets was colored with America's flag and the red, white and blue colors. Principal John Peck got the idea from watching the Iowa Hawkeyes. Iowa sported a similar honor with a flag-colored Hawkeye on its helmets when Iowa played Michigan on Nov. 5. "It was a great way to honor our veterans and the service they've given to our country," Kirkland said. "Football is an all-American game and that was a great way to sponsor that."